Naples wedding photographer Joe Capasso took this image of Kristin and Andrew during the couple's trash the dress session. It won Professional Photographers of America's Summer shoot out award! Kristin and Andrew had a destination Marco Island wedding at the Marco Beach Ocean Resort. Since they are from Ohio and were having a destination wedding, they decided to stay in the area for about a week. Kristin knew she wanted to use the opportunity to do a trash the dress session with me. We've done plenty of trash the dress sessions for brides but none in the middle of a Summer Florida thunderstorm at sunset! One of the best things about Southwest Florida, and the entire west coast of Florida are the incredible sunsets. 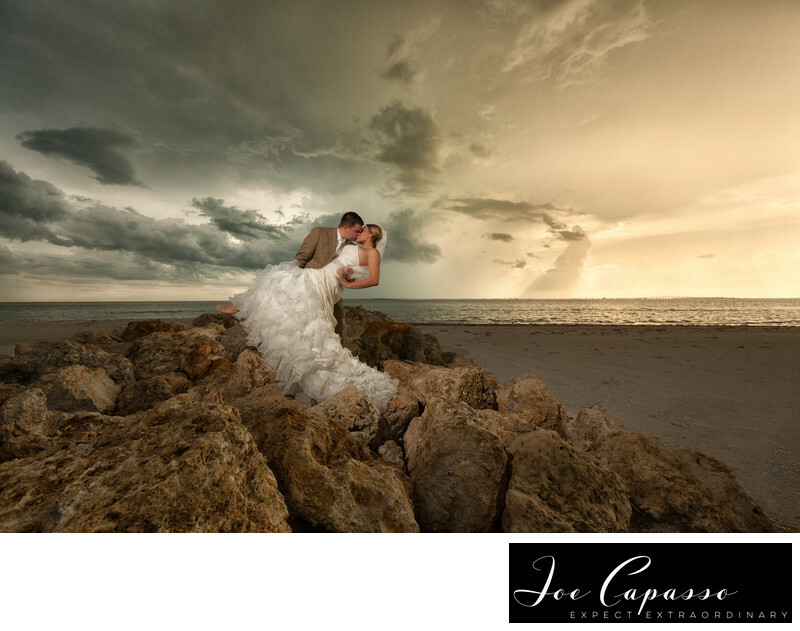 Many Miami wedding photographers come to this coast just for the sunset! Even though her wedding was on Marco Island, we photographed her trash the dress closer to the Naples area. At one point we had to run back to the car and we were completely soaked! It was totally worth it! Kristin told me she was looking for an awesome Naples Wedding Photographer to give her images she'll cherish for a lifetime. I think we pulled it off with this epic photograph. We love the texture in this image, and the lighting. It was lit with a bare Canon 500-EX flash triggered with pocketwizards. My assistant was standing on the rocks with me holding the flash just off camera to the left. The ambient exposure was determined ahead of time with just enough flash added to light the couple without making it look too “flashy” or unnatural. We love capturing all the detail in every image. Without proper exposure and lighting, the sky would be a blown out white color. Blown out skies are one of my pet peeves when it comes to wedding photography. There was minimal photoshop done to the original image straight out of camera. Some fly-away hairs were removed (we were in the middle of a storm), and slight sharpening applied. The sky was not added in post production. This is just one of the epic images we created from this session. To see more, browse through our Naples Wedding Photographer gallery.Keywords: marco beach ocean resort (3), marco island (3), marco island wedding photographer (12), miami wedding photographer (12), naples photographer (18), naples wedding photographer (45), naples weddings (12), pocketwizard (3), ppa (3), professional photographers of america (3), trash the dress (3). 1/400; f/7.1; ISO 400; 16.0 mm.